V Ferrox Iron Oxide Pigments find their widest range of application in the building industry.They show good weather resistance, which is ensured by the fact that the products are synthetic pigments based on stable iron oxides. Light fastness is confirmed by a number of tests. Generally, iron oxides are resistant to alkalis and are characterised by a high colouring power, which in the case of V Ferrox pigments is guaranteed by the Fact that they are synthetic pigments without any other constituents/ fillers. 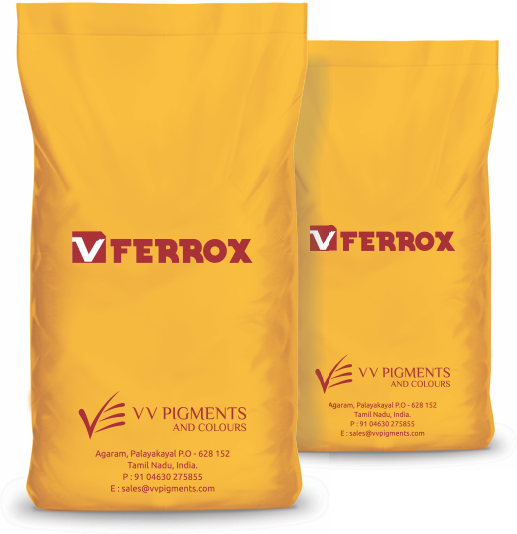 If correctly applied, V Ferrox pigments show good dispersibility, (the ability to be processed) in concrete mixtures. Pigments based on iron oxides are inert and due to this remain environmentally safe. Fine dry-milled pigment with good tinting-strength and hiding power. Both alkali and weather resistant. Suitable for the production of paints, both in solvent-based and waterborne systems, (e.g) air-drying, oil-bound and decoratives, also for primers,undercoats and fillers. In the building industry, good for the production of cement-based plaster mixtures synthetic plasters, the coloring of the concrete products such as roof tiles, terrazzo and coloured floor tiles. Fine dry-milled pigment with very high tinting strength, hiding power and good particle size distribution. Both alkali and weather resistant. Suitable for the production of paints, including primers, powder coatings, undercoats and fillers, in the building industry for cement -based Plaster mixtures the colouring of concrete products such as roof tiles, terrazzo and coloured floor tiles.